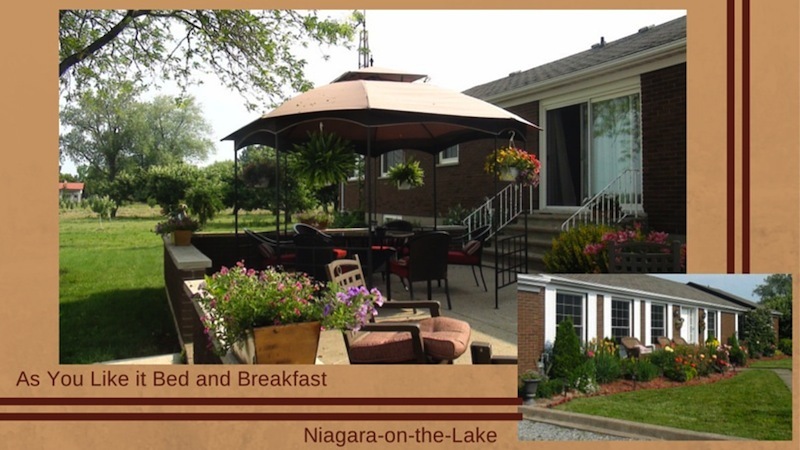 Situated in the heart of the peaceful, Niagara on the lake farming community, As You Like it Bed and Breakfast is only minutes from all of Niagara on the lake's major attractions. When you return to your room after a busy day out, you are assured a peaceful rest in any of our three fabulously comfortable rooms! Wander through our orchard and sample the fresh fruit that is in season before enjoying a wonderful breakfast that will satisfy any hunger and keep you coming back! Your patronage will help support our work to bring water to those in need. Read more about our work in Guatemala at www.wellsofhope.com. After our breakfast you will have no need for lunch! Situated in the heart of the peaceful, Niagara on the lake farming community, As You Like it Bed and Breakfast is only minutes from all of Niagara on the lake's major attractions. When you return to your room after a busy day out, you are assured a peaceful rest in any of our three fabulously comfortable rooms! Wander through our orchard and sample the fresh fruit that is in season before enjoying a wonderful breakfast that will satisfy any hunger and keep you coming back! Your patronage will help support our work to bring water to those in need. Read more about our work in Guatemala at www.wellsofhope.com. With Miriam's Italian heritage and cooking creativity, each breakfast will be an adventure to your taste buds! Breakfasts include local fresh fruit (with home made whipping cream if you wish), cold cereal, yogurt, ham, bacon, sausage, hash browns, freshly baked selection of bread, muffins,cakes and even pie, eggs served in a variety of ways (each morning is a new creation by Miriam), bottomless coffee pot (that can begin at 4:30 a.m.), juice, a selection of teas, milk or hot chocolate, and if these don't work, there's always water! QEW to Glendale exit North. Right turn on York Road. Left turn on Concession 2 Road. Stop at # 840!